Fuel filter and water separator with transparent bowl on a Tigercat LX830D feller buncher. Understanding these requirements and putting some simple best practices in place will ensure that your Tigercat FPT engine provides peak performance and a long, trouble-free service life. Diesel engines have been around for over 100 years, and because of the greater energy density of diesel fuel they are common among all kinds of heavy machinery. In recent years, new environmental regulations in the United States and the European Union have had a profound impact on diesel fuel and engines. Modern diesel engines operate at much higher temperatures and pressures than in the past. This means that even slight contamination in fuel can result in serious engine damage. Fuel quality problems and/or inadequate filtration can lead to poor starting, reduced performance and low power which lead to reduced fuel economy while creating wear throughout the engine. Solid contaminants as small as 4 microns can lead to premature failure of fuel injectors and other components. A micron – also known as a micrometre – is one thousandth of a millimetre (1/25,000 of an inch). A human hair is approximately 100 microns in diameter. 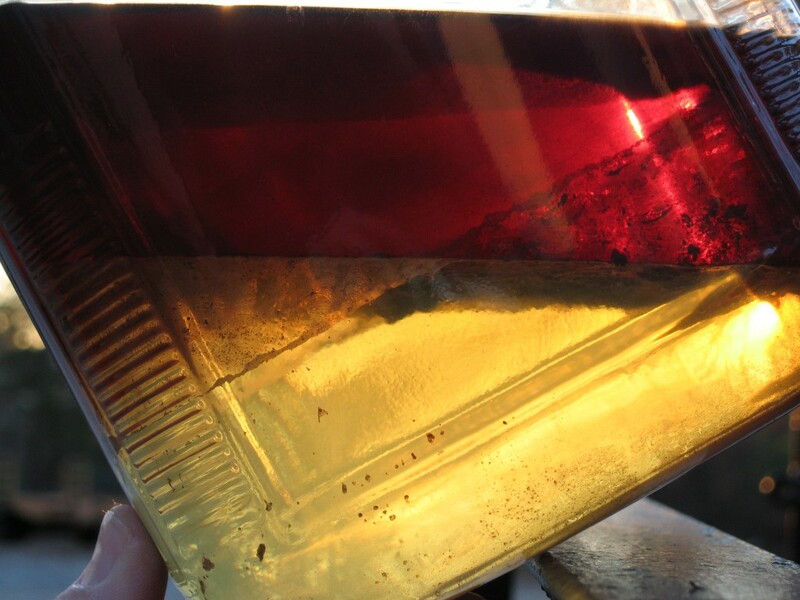 Diesel fuel is denser and has a more complex chemistry than other fuels such as gasoline and can develop a number of problems if not handled and stored correctly. Dirt, water, algae and asphaltene are all contaminants that cause fuel filter plugging or collapse, resulting in severe damage to the engine and fuel system. A fuel filter clogged with algae. Water and dirt can enter fuel storage tanks and cause algae (microbe) growth. Removal of water in the fuel is key to limiting algae. Long periods of fuel storage can create an ideal environment for algae to grow in fuel storage and vehicle tanks. If algae is allowed to grow in fuel tanks it can become diffi cult to remove. An additive can be added to the fuel to address the problem, but if a heavy “bio-film” of algae has accumulated on the surface of the tank or other equipment, the additive may not be able to completely penetrate the film. This results in short-term relief, but the problem quickly returns as the algae further reproduces. In this case, the fuel tank may need to be completely drained and cleaned by qualified professionals. Asphaltene is the term used for high carbon content fuel molecules, which are naturally present in diesel. Asphaltene buildup is due to high fuel injection pressures used in modern diesel engines. The diesel fuel is continuously recirculated and exposed to high pressures and heat, which results in the agglomeration of asphaltenes into larger and larger clusters of solids. These solids may grow so large that they damage the fuel injectors or plug the fuel filter. Fuel filters for Tigercat FPT engines must meet Tigercat’s filtration and water separation specifications. Failure to use the correct filters will severely impact fuel system life and reliability. Damage that results from using improper filters will not be covered by your Tigercat warranty. Filters must be changed every 250 hours or more often if there is reason to suspect fuel is contaminated. Where equipped, the transparent fuel/water separator filter bowl should be checked daily and water drained from the system as required. For maximum protection of your Tigercat FPT engine, fuel should be filtered coming out of the storage tank. Tigercat recommends using a multistage filtration system on diesel storage tanks or mobile fueling carts. This helps to ensure the fuel put into the vehicle is at the correct quality level to prevent premature filter clogging. Tigercat also recommends adding appropriate additives to diesel fuel in storage to ensure fuel quality. An asphaltene additive can help prevent the buildup of asphaltenes, stabilize fuel in storage and clean fuel injectors. Regular microbicide treatment will help prevent algae and microbial growth. Check with your supplier that additives are compatible with Selective Catalyst Reduction (SCR) after treatment systems. Tiny particles can score and damage fuel injector ports. Finally, machine owners need to take action to ensure their diesel fuel tanks are sound and not leaking or corroding. Zinc galvanized steel tanks must never be used for storing or transporting fuel. Dissolved zinc will severely damage fuel injector nozzles. Care must be taken with any portable tanks or fuel carts to ensure they are clean and not corroded. Fuel tanks should be inspected regularly by qualified professionals and tested with a water detecting paste to ensure they are not accumulating water at the bottom and that water is not leaking into the tanks. Areas around tanks should be kept secure and tanks should be locked to prevent tampering. The bottom line is that modern diesel engines demand more attention to fuel quality and filtration than was the case in the past. By following these guidelines you can ensure the smooth operation of your Tigercat FPT engine for years to come. Contact your Tigercat dealer to ensure you have all the right filters and are taking the right steps to protect your investment.